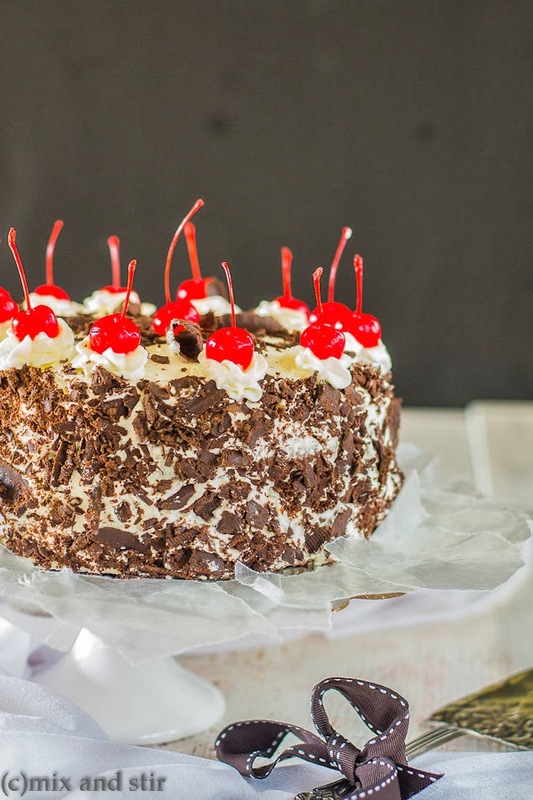 Black Forest Cake which is also popular by the other name Black Forest Gateau, it's a German dessert, made with chocolate, cherries and whipped cream. 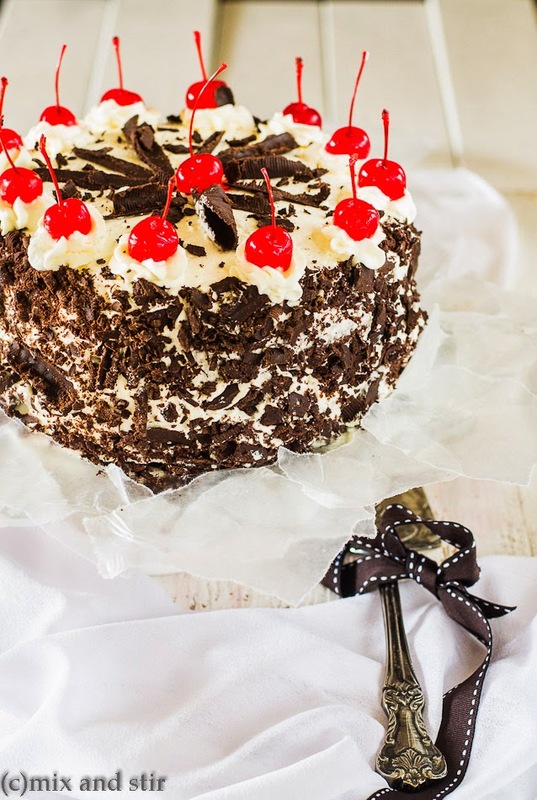 A Classic German black forest cake is one of the easiest cakes to make and oh so impressive . 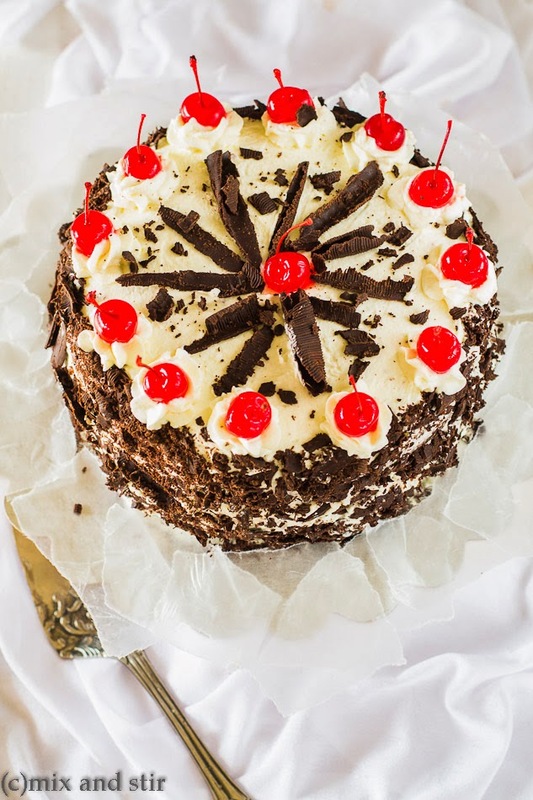 Typically Black Forest Cake consists of several layers of chocolate cake, with whipped cream and cherries between each layer. Then the cake is decorated with additional whipped cream, cherries and chocolate shavings. If you want to make it in traditional way, Krischwasser, a liquor from cherries is must added to the cake. But you can make it without alcohol too, which is most often prepared in the Untied States. Same thing with in using the cherries, either you can use black cherries or maraschino cherries, both way I tried and it is equally good. Last week it was my husband's birthday, I was thinking which cake I could make for him. Then it came to my mind, in our early married days it was the black forest cake, we used to bring from the cake shop to celebrate any occasion. :-) So to revive some good memories revisited the Black Forest. This is not the first one, couple of years ago I tried my first Black forest, so I had little confidence, that it could become a mess but will taste no doubt delicious. And the process of making this cake is not so difficult, rather you can say easier than any other decorative cakes. But you need little penitence and it is better to make it one or two days before you serve. and always chill the cake for 3 to 4 hrs before serving. It tastes better when you serve this way. I love Cake decoration as well as baking, it is my favorite field, but sometimes, due to my health consciousness, avoid making this frosting stuff, but I am sure this one does have a quite high calorie as it contains no butter, this cake at least seems much lighter than other cakes. Heavy Whipping cream : 16 oz. 1. Preheat the oven to 350 degrees F or 176 degrees C. Grease an eight inch cake pan with nonstick vegetable spray. 3. In another bowl, add flour, baking powder and salt and whisk it. Take butter and sugar in another bowl, beat them with a hand mixer or with a spatula until they become light and fluffy. 4. Add the eggs one by one and beat until it becomes smooth. Beat in vanilla extract. Add the flour mixture to the egg mixture and beat nicely until incorporated. 5. Now add the cocoa mixture and mix the whole thing till it becomes well combined. Pour the batter evenly into the prepared pan and bake it for about 30 to 40 minutes or until a toothpick inserted into the center of the cakes comes clean. 6. But make sure don't over bake. Remove the cake from the oven and place on a wire rack to cool for about 10 minutes. Once it is completely cool, remove it from the pan. 7. With a serrated knife, cut the top swelling part off and then cut the cake into half horizontally. To cut the cake into two even layers, use a ruler. Even layers help the cake to be steady. 8. Drain cherry pie filling in a colander to remove most of the thickened juices. 9. Sprinkle kirsch over both cake layers. Handle the layers with utmost care. 10. Chill electric beater and a large mixing bowl. Beat the cream until it thickens slightly, gradually add the sugar and beat just until stiff peaks form. Immediately cover it and refrigerate it. 11. 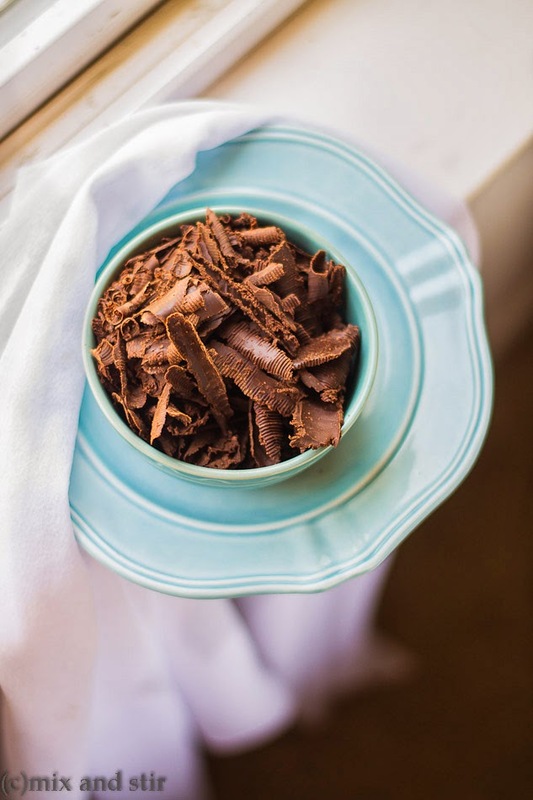 Using a vegetable peeler, shave chocolate and refrigerate it until ready to serve. 12. Place one layer on serving plate and spread its top with 1/2 inch thick layer of whipped cream and put the cherries over the cream, leave about 1/2 inch margin around border of cake with on cherries. 13. Put other layer on top of cherries and spread the remaining cream on the top and sides of the cake. 14. Make some decorative swirls on the top and gently press the chocolate curls on the sides of the cake. 15. Decorate the top with drained maraschino cherries and remaining chocolate curls. 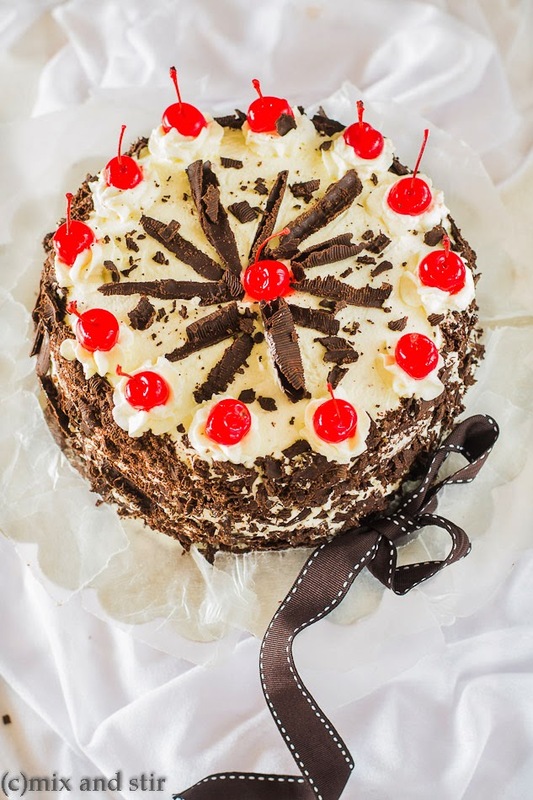 Black Forest Cake is ready, serve chill. This looks heavenly! ANd I bet it tastes amazing too !